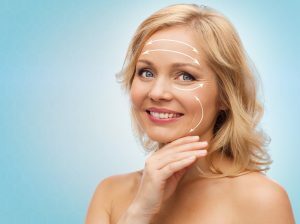 Sollay Laser Center of Excellence is excited to offer our patients a non-surgical, completely painless 20 minute facelift. No, this is not a joke. It is a very big deal. TempSure by Cynosure is a medical therapeutic heating device that emits radiofrequency (RF) waves designed specifically to stimulate collagen production. The body as a result of radiofrequency (RF) stimulation sends growth factors to the area treated to build new collagen. This leads to firmer, tighter, less wrinkled skin. Radiofrequency (RF) technology has been around for years and has been used by family physicians, dermatologist and plastic surgeons to improve skin quality and to tighten skin by stimulating collagen development. However, TempSure takes this entry level technology to an advanced level not previously possible by previous equipment like Thermage, Thermi or Pelleve. TempSure uses a higher temperature of skin stimulation without causing pain making the treatment faster and more effective. While using TempSure, there is no discomfort, just a warming sensation of the skin and there is absolutely no downtime. Literally, you can get this procedure done during your lunch break and no one would be able to tell. In general, the entire procedure is over quickly. The treatment time depends on the area treated. Most places like a full face, full abdomen or upper or lower legs or thighs takes about 20 minutes for each area with results being seeing almost immediately. You will see tightening effects after your first treatment though the real improvement sets in after 4-6 weeks as collagen growth continues to occur. Most patients require more than one treatment to obtain the desired result. Four treatments total spaced every 2-4 weeks depending on what you are getting done and the results that you desire are common. The good news is that the collagen that you develop is permanent. The collagen that you generate from TempSure is permanent though it won’t prevent gravity from taking its natural toll as we continue to age. This is why the Sollay Laser Center staff recommend that touch-up sessions every six months or once a year. Although this is totally optional, we believe that this will prevent your body from reversing the effects of aging. TempSure is a huge leap in technology. The results and comfort are unbelievable. It truly is an effective facelift and neck lift that doesn’t require surgery, Botox or Retinol. Pricing varies depending upon the area that you want treated and the number of treatments that are needed to obtain your desired results. We recommend you book a free consultation with our board certified staff at Sollay Laser Center of Excellence today.